Share this product and receive a $1.34 sharing discount. 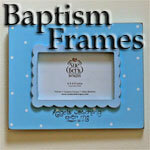 Elegant porcelain and resin picture frame celebrates the baptism of a child. Features organic swirling designs, silver-tone accents, and a sculpted cross. Precious Child of God, He loves you very much. May you walk in His love all the days of your life. 6.5" wide with horizontal opening for any 3.5" x 5" photo; boxed for giving.